Being able to find a qualified and experienced translator who can accurately translate an important document while still upholding the integrity of the original transcript can be extremely difficult. Here at Language Australis, we understand just how important it is to find a trustworthy translator who can provide excellent results at competitive prices. The Spanish translation specialists at Language Australis are all accredited by National Accreditation Authority for Translators and Interpreters (NAATI) and are native speakers of the Spanish language so you can be assured that you are receiving authentic language translations. At Language Australis, we can translate a range of documents for a wide variety of businesses, corporations, governments and individuals. Our certified translators have professional expertise in diverse industries and private subject matter. Our team of language and translation consultants has expansive knowledge on a range of topics such as medicine, commerce, technology, finance, marketing, science, law, and many, many others. We have a team of qualified translators who are specialists in Spanish and are able to assist you in the translation of documents such as birth certificates, business data and court documents and can deliver the most accurate and prompt, translations. There often many cultural boundaries that occur when translating documents and these boundaries can interfere with providing an authentic translation. We carefully select and assign the right translator for each individual request to ensure that the correct terminology and expressive language will be used to reach the target audience. If you need NAATI-certified Spanish translators who have in-depth knowledge and experience in the industry, then Language Australis’ team of highly skilled translators can help you. Before thinking of having your documents translated by Vietnamese translation specialists, why not discover a little about the language itself? Spanish, also called Castilian, is a Romance language that originated in the Castile region of Spain. Romance languages include Italian, French and Portuguese. The earliest known written use of the Spanish language was in Toledo, Spain, in the 13th century. The Spanish language was strongly influenced by the Arabic language between the 8th and 14th centuries when Spain was under Islamic rule. Eight per cent of Spanish words come from the Arabic language. After Spain colonised large areas of America from the late 15th century onwards, the Spanish language also absorbed vocabulary from Nahuatl, Quechua and other indigenous languages. Some of these words have been absorbed by the English language too. For example, jerky (as in beef jerky) comes from Spanish charqui, which in turn comes from Quechua ch’arki (dried flesh). There are over 300 million native Spanish speakers around the world and Spanish is the official language of 21 countries, almost all in Central and South America. Spanish is considered the world’s second-most spoken native language, after Mandarin Chinese. In documents translated from English to Spanish, you’ll notice the use of inverted question and exclamation marks (¿ and ¡). You may also notice that the Spanish translation may occupy up to 20% more space than the English original. This is because the Spanish language is more detailed and expressive than English. It is important for Spanish translators to gauge the level of formality required in a text. E.g. 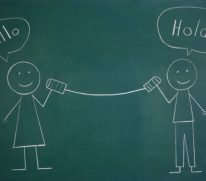 there is a formal and informal way of saying you in Spanish – Usted and Tú – and it is essential that the correct version is chosen. Good Spanish translators must also be aware of the use of accents since these can completely change word meaning. For example, mi and mí mean my and me, and leaving off that little accent can reflect badly on the Spanish translation.